Everyone was gathered in the living room celebrating Maddy Harper's birthday. Maddy's mom came in from outside and took everyone out to the barn. Once there, Maddy got on her horse Rio. After that, all the other kids got on other horses in the barn. After saying bye to the parents, the kids went to ride on the trails. Maddy thought she would show off and go somewhere she had never gone before. The sky started to get dark and she started to worry. Peyton called from the back of the group that she heard something. The group started to get very scared. They heard a rumbling getting closer and closer. Thinking it was thunder, they shrugged it off. The sound didn't stop. 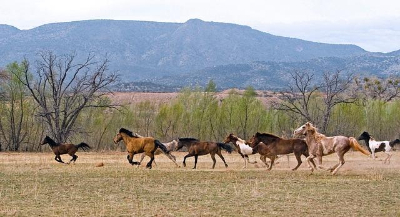 Right in front of them, a herd of wild horses burst from the trees. The wild herd stopped dead in their tracks. "Hey y'all, lets pet them," Maddy suggested. All the girls dismounted and stood by their horses. Maddy slowly walked up to the horses but quickly wished she hadn't. The horses had a fit. They started bucking and kicking. One nailed Maddy right in the leg. She fell to the ground screaming. The horses took off. All the other girls gathered around her and tried to comfort her. The adults had been looking for them and came running with their horses when they heard the scream. Maddy's dad dropped off his horse and knelt beside her. He grabbed her up and put her on the saddle. He knew her leg was broken but he didn't say anything. They rushed back to the barn but weren't quick enough because Maddy blacked out before they got back. There was something seriously wrong but no one knew what. Great story! Please keep going!